Heriot’s surrendered top spot in the BT Premiership after going down 29-25 to new leaders Ayr at Goldenacre. The Capital side led 20-17 at half time after Graham Wilson booted two penalties, then converted tries by Charlie Simpson and Harry Boisseau. However, the visitors outscored the hosts in the second half to seal the win before a touchdown from Russell Nimmo gave the champions a narrow defeat bonus. Next up for Heriot’s is a trip to face Boroughmuir on Friday. The Meggetland men, now the only unbeaten side in the division, warmed up for that clash with a 32-12 win at Gala. Tries from Andy Rose, Callum Reid and Grant McConnell, plus a penalty and two conversions by Dougie Steele, handed Muir a 22-5 interval lead. Further scores by Robbie Smith and Scott Burnside sealed all five league points. Currie suffered a first home loss of the season when they went down 36-29 against Glasgow Hawks. It was the second successive last-minute defeat for Currie, who had two tries from Chris Logan and one apiece by Matt Goodwin and Cameron Gray as they took two bonus points. Musselburgh moved up to third place in BT National Division One when they beat Stewart’s Melville 37-24 at Stoneyhill. 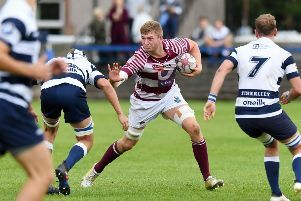 Burgh dotted down five times to extend a winning run at home that includes successes over Edinburgh Accies and Watsonians earlier in the campaign. There was some consolation for the visitors in the form of a four-try bonus, including a score by Sean Murchie on his first appearance since rejoining the Inverleith club. The win leaves Burgh five points adrift of second-placed Sonians, who returned from Jed-Forest with all five points after overturning a ten point half-time deficit to chalk up a 34-30 win. Following two successive victories, Accies conceded 31 unanswered points before scoring two converted tries as they suffered a 43-14 loss at Dundee High. Lasswade leapfrogged Preston Lodge in the Division Two table after chalking up a 36-16 win at Hawthornden, while Haddington moved up to fifth in Division Three with a 31-24 win at RHC Cougars.